How to track an object which is Out of Scope while Debugging? In Mastering in Visual Studio 2010 Debugging article, I have discussed about the basics of Object ID creation while debugging. I received some requests from some readers to explain the use of “Make Object ID” in detail. In this blog post, I am going explain how we can track an Object which is already out of scope using by creating a Object ID while debugging. 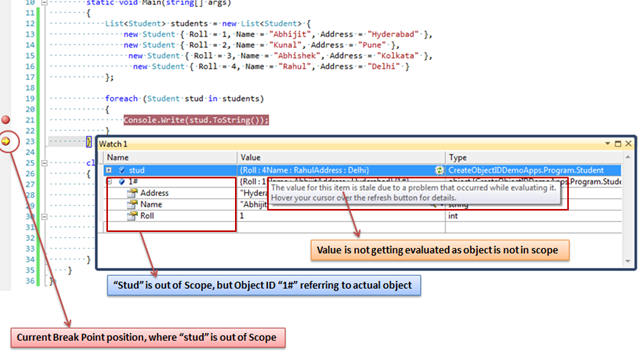 By using “Make Object ID” option, we are informing Visual Studio Debugger to keep track of that object no matter whether it’s within scope or out of scope for the current context. We can create “Object ID” either from Locals, Autos or from Watch Windows. Object ID is a integer number followed by a pound (#) sign. When we create Object ID for an particular object, Visual Studio Debugger ( CLR Debugging Services ) uses an integer value to uniquely identify the object. This “Object ID” allows you to get the object details even if it is out of scope. As per the above code, we have a list of Student object. I will show you how we can create a new object ID for any specific object and can track it even though it went out of scope. To make an Object Id, you have to view the object from Watch Window, then Right Click > Context Menu, select “Make Object ID”. The watch window will display a number with the pound (#) sign . The Object ID number will increment based on the object ID Creation. Which means for the next object ID the identification number will be like 2#,3#, etc. You have already created an Object ID ( 1#) for a particular student object from list of Student objects. let’s have a look at how to use that object Id. You can easily type the object id in the watch window to get the details value of that object. So as per the above image, you can see 1# object ID showing the details of the student object with Roll= 1, for which we have created that Object ID. If you look into the details, you can see, though current break point showing the student details with Roll=3, still 1# Object ID pointing to Student Object with Roll 1, because of 1# object id now uniquely identifying one of the student objects. You can create and use the multiple Object ID using the same process that I have discussed. If you want to keep track of more than one object, you can use it. When Object Goes Out of Scope? Till now I have discussed how to create an Object Id and how to use them. Now let’s discuss about the actual use if Object ID. As I have already said,”Object Id is used to track any object even if the object is Out of Scope”. In my above example, both the object ID and the actual object was in the scope of current context. Let’s have a look at when the object goes out of scope and what is the behavior of Object ID at that time. To explore this, just put a break point outside of foreach statement, where “stud” object is not in the scope. Run the application and Create an object Id for the first object of student lists. Wait till when debugger hits the breakpoint next to foreach statement. But you can get the same object values from the Object ID. Though your actual object goes out of scope, it’s not collected by the GC, Object ID still keep track of that object as the object is still present in memory. You will get the message “Can't evaluate object” once the actual object has been collected by the GC. Working with “Out Of Scope” Object? Similarly, we can access the same variables from “Immediate Window” as well. You can also set conditional break points with the created object Ids. I have explained about how to use conditional break points over Mastering in Visual Studio 2010 Debugging – Conditional Breakpoint article. We have to use the same way that I have mentioned while discussing about the accessing Object ID. The above conditions tell the Visual Studio Debugger that if the Object with Object ID 1# has Roll =1, then only hit the break point. You can delete the object using the similar way that you have used for creating an Object Id. Right Click on the Object Instance for which you have already created the Object Id, you will get “Delete Object ID” Option. If you delete the Object Id with a specific number, it does not mean the next created ID will be the same ID that you have deleted. This means, let's say, you have 3 Object IDs 1#, 2# and 3#. You have deleted the object ID 2#. Now if you create another new Object ID, new ID will be 4# not 2#. Which indicates, one Object ID is used to uniquely Identify a particular object Instance, not for the same object again or for other object. The same ID can only be used once GC collects that object. In this blog post, I have explained how we can use Object ID to keep track of an Out of Scope Object. By using “Make Object ID” option, we are informing Visual Studio Debugger to keep track of that object no matter whether it’s within scope or out of scope. When we create Object ID for an particular object, Visual Studio Debugger (CLR Debugging Services) uses an integer value to uniquely identify the object. This “Object ID” allows you to get the object details even if it is out of scope. If you received the message “Can't evaluate the Object Values” while working with “Object ID”, it means that Object has been garbage collected. This is another way where you can identify that an Object has been garbage collected.
. Hitting debug point and in watch I am adding stud object. 2. Right click to that object and clicks 'Make Object ID'. 3. object renamed with Pound(#) Prefix. 4. Second object hits debugger point. 5. previous stored value gets disappeared and comes new fresh stud object. Go to Next Cell in Watch Window > Type 1# ( assume you have created object ID ) > Press Enter. Let me know, if still you have doubts. Got it Man, All doubts cleared. Thanks for your time solving problem Take my +5+5.